I have very little time for blogging these days, but because I’m both ahead of and behind my schedule, I thought I’d spend a few moments writing a post about our Portland trip. My girls and I arrived back at Albuquerque Sunport late Tuesday night, woke to a brilliant New Mexico day on Wednesday, and have since attempted to ease into our normal schedule. We unpacked. We stowed the suitcases and started the laundry. I finished filling in my eldest daughter’s grade sheets and sent them off to her high school academy. We–or at least–I feel like a victor, even though my house is filthy, and I missed my chiropractor appointment this morning. I should be at that appointment right now, so why not blog instead? It takes a lot less effort than cleaning. I have much to say about the trip to Portland, but I won’t attempt to cram it all in one post. I will reserve this post for the best part, 17th C England. What, you ask, does 17th C England have to do with Portland in the 21st C? Nothing, except that I discovered Jody Hedlund’s debut novel, The Preacher’s Bride, facing out and on prominent display in Barnes and Nobles while visiting. And the setting of the her book is 17th C England. I couldn’t help myself. I had to buy it. I will not lie to you. I don’t particularly care for romance books. I like romance in a book, but not a book that is labeled as such. And if I were to create a gradient scale, books written by English people in the 17th C would be at the top of the scale, with historical fiction below it and historical romance even further down on the decline. Other genres would fill in the gaps: I love travel memoir, for example. Travel memoir is somewhere at the top of the scale. 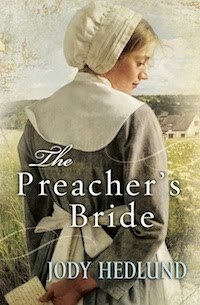 The Preacher’s Bride, however, is the type of book that ensnares the reader, regardless of its genre. Once I’d begun, I couldn’t easily put it down. The heroine lures the reader into her story with her enticing character. She’s strong-willed, intelligent, and speaks her mind without being flighty or spunky. I hate spunky heroines. Spunky heroines are stereotypical females with a lot of pluck combined with much silliness (think Shopaholic). They make me want to retch. Hedlund’s heroine, Elizabeth Whitbread, is far too hardworking and honest to be spunky. Elizabeth Whitbread is a Puritan maiden who knows no other kind of life but that of the plain and hardworking variety. She enters the world of her love interest, John Costin, as his housekeeper, to care for the man’s children after the death of their mother. She faces many battles as his housekeeper–with him, with some of the local Puritans, and with the Royalists who desire to restore the crown of England. She’s caught in the middle of these forces around her and, to complicate matters, falls in love with John Costin, who, as an arrogant but likable preacher, is the greatest force she must reckon with. If you like historical novels, you will enjoy this book. If you like romantic novels, you will enjoy this book. I personally don’t go in for people “probing the depths” of each others’ eyes (which sounds very painful, in my opinion), but that is my prejudice. I would still rate this book as a 4 out of 5 stars due to the quality of the writing, the story, and the characters. I would not give it a 5 out of 5 because, for me, the book lacked setting and background. I came away not knowing enough about the town where they lived and the way of life of the Puritans who lived there. And if I didn’t already know much of the historical background, I would have come away with a deficit of understanding. I’m the type of reader who wants details, and a lot of them. This is not to say that the author didn’t give any details, but not enough of them, or not enough of the right kind. I’d trade the romantic bits for historical/setting details any day. ***I’m editing in to add that the problem here is not with the author, but the reader. I hope I’ve made that clear. It’s a matter of my preferences. And that brings me to my ultimate prejudice. I’m not altogether sympathetic with Cromwell’s regime. Religious persecution did exist in England under Charles I. But when Cromwell established the Commonwealth of England, he replaced one tyrannical government with another. That almost never works. People who work very hard day after day don’t like it. And, for all the supposed religious freedom under Cromwell, Catholics were still oppressed. Charles II, who was restored to the throne in 1660, was an amoral man in many ways, but he brought back the art of theater and was a great patron of the arts and sciences. I have to admit, though, that Elizabeth and John are more than simply Puritans characters. They are complex characters whose lives are affected by the changing of the guard–when all they really want is to have an intact and healthy family (Elizabeth’s desire) and preach the gospel of Christ (John’s desire). Why any government should oppose such peaceable desires is beyond me. That's something I struggle with in my own writing, am I offering enough detail, too little? I personally like sparse detail because I like to fill in the blanks a little. It's hard to figure out what readers would prefer. Good thought provoking post. Wow! What a comprehensive review. Thanks for sharing it, Jill. I, too, enjoyed The Preacher's Bride. One aspect I felt the author did quite well was use dialogue to set the period. The diction fit the era and kept me grounded in the 17th century. I also thought the characters were well developed. Neither Elizabeth nor John were perfect; both were people with lessons to be learned and room to grow. Unlike you, I'm an avid reader of romance, and I thought the burgeoning relationship between John and Elizabeth was nicely handled. T. Anne–I think my desire for detail is relatively uncommon for today's publishing standards. Too much detail usually is edited out by publication, isn't it? Thanks for stopping by! Keli–I too felt that the dialogue was very good, but forgot to mention it. Sorry to Jody on that! Jody–it was an enjoyable read. I hope that I made that clear. It's just that romance isn't my usual top pick. But there was so much to like in your book other than the romance. It sounds like a really good book. Will speak with you soon I'm sure. Take care. Sounds like I need to read this novel! While I love romance, I also prefer to have more than romance in stories such as suspense, mystery, some other plot line. Thanks for sharing. Thanks for stopping by, Jennifer. Yes, you should read this book. It's worth the while. It's so nice to see Jody's book getting such good reviews. I read it and loved it! Testing comment functionality . . . I wish I had the time to read more. I have so many books started and none near finished.